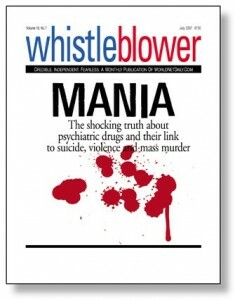 Fact: Despite 27 international drug regulatory warnings on psychiatric drugs citing effects of mania, hostility, violence and even homicidal ideation, and dozens of high profile shootings/killings tied to psychiatric drug use, there has yet to be a federal investigation on the link between psychiatric drugs and acts of senseless violence. School-related acts of violence aren’t the only cases commonly found to be under the influence of psychiatric drugs. There are 28 other acts of senseless violence committed by individuals taking or withdrawing from psychiatric drugs resulting in an additional 270 dead and 164 wounded. To read all drug regulatory agency warnings & studies on psychiatric drugs, visit CCHR’s Psychiatric Drug Side Effects Search Engine. United States, May 12, 2017: The FDA updated Dyanavel XR’s (amphetamine) Medication Guide to include the fact that the drug can cause serious side effects including: abuse and dependence; sudden death in children and adolescents who have heart problems or defects; hearing voices; new manic symptoms; and circulation problems in fingers and toes. Source: “DYANAVEL XR, Safety Labeling Changes Approved By FDA Center for Drug Evaluation and Research (CDER),” Food and Drug Administration, 12 May 2017. Australia, October 2013: The Therapeutic Goods Administration issued a warning about atomoxetine and suicidality in children and adolescents. It noted that the risks of suicidal ideation and behavior with atomoxetine are well known, therefore: “Parents and caregivers should be warned of the risks and alerted to the need to monitor for signs of unusual changes in behavior or precursors of suicidality, such as anxiety, agitation, panic attacks, insomnia, irritability, hostility, aggressiveness, impulsivity, akathisia [severe restlessness], hypomania [less severe form of mania] or mania. Parents and caregivers should also be advised of the importance of seeking immediate medical attention if such signs are identified…”. Source: “Atomoxetine and suicidality in children and adolescents,” Medicines Safety Update, Volume 4, Number 5, October 2013. United States, February 2013: The FDA added the following side effects updates to the “Adverse Reactions” in Pristiq’s (desvenlafaxine) drug label: Suicidal Thoughts and Behaviors in Adolescents and Young Adults; Hyponatremia (abnormally low levels of sodium in your blood); Interstitial Lung Disease (a disease that describes a large group of disorders characterized by progressive scarring of lung tissue) and Eosinophilic Pneumonia (a rare disorder characterized by massive accumulation of white blood cells in the lungs); Serotonin Syndrome (a potentially serious and potentially life-threatening drug reaction that occurs when too much serotonin builds up in the body); Elevated Blood Pressure; Abnormal Bleeding; Narrow-Angle Glaucoma (an eye condition that leads to damage of the optic nerve from the fluid in the eye not being able to drain properly); Activation of Mania/Hypomania; Discontinuation Syndrome (antidepressant withdrawal symptoms); and Seizure. Source: “Pristiq (desvenlafaxine) Extended-Release tablet,” FDA Medwatch, February 2013, FDA Medwatch, February 2013. United States, February 2012: The FDA updated Adderall XR’s (dextroamphetamine and amphetamine) label to include more adverse reactions that occurred with the use of Amphetamine, Adderall XR, or Adderall. This included: Psychotic episodes at recommended doses, overstimulation, restlessness, irritability, euphoria, dyskinesia (difficulty in performing voluntary movements), dysphoria (a feeling of being ill at ease), depression, tremor, tics, aggression, anger, logorrhea (excessive and often incoherent talkativeness or wordiness), dermatillomania (repetitive picking at one’s own skin to the extent of causing damage), eye disorders, blurred vision, mydriasis (dilation of the pupil of the eye that is usually excessive or prolonged), constipation, gastrointestinal problems and alopecia (condition in which one’s hair falls out). Source: “Adderall XR (dextroamphetamine mixed salts of a single-entity amphetamine product) Capsules,” FDA, February 2012. Australia, October 2011: The Therapeutic Goods Administration issued a Medicines Safety Update to inform the public the stimulant Modafinil (Modavigil) has had several safety changes and recommendations to its package insert after reviewing reports of serious skin, psychiatric, nervous system and cardiovascular adverse reports. These changes include warnings that Modafinil has been associated with multi-organ hypersensitivity reactions (potentially life-threatening reactions), aggressive and hostile behavior, suicidal ideation, suicidal-related behavior, psychosis, mania, depression, dependence potential, skin and hypersensitivity reactions, serious skin reactions in pediatric patients, and cardiovascular disease. Modafinil is not approved for pediatric patients for any indication. Source: “Modafinil (Modavigil) – safety update” Medicines Safety Update, TGA, Volume 2, Number 5, October 2011. United States, October 1, 2010: The FDA added “aggression” to the warning section of Provigil’s package insert. Source: “Provigil (modafinil) tablets,” FDA Center for Drug Evaluation and Research, October 2010. New Zealand, June 1, 2010: New Zealand’s drug regulatory agency MedSafe has reviewed recent changes to the European product information for methylphenidate (Ritalin) and recommended that the New Zealand data sheets be updated to include these changes. The changes outline that patients being considered for methylphenidate treatment should be carefully screened for cardiovascular risk, heart disease and psychiatric disorders, including any family risk factors. Also, because methylphenidate can cause or worsen some psychiatric disorders (such as depression, suicidal thoughts, hostility, anxiety, agitation, psychosis and mania) patient’s “psychiatric well-being” should be monitored. Source: “Methylphenidate – updated guidance when treating children,” New Zealand Medicines and Medical Devices Safety Authority, June 2010. United States, July 01, 2009: The FDA has required the manufacturers of the smoking cessation aid/antidepressant bupropion (Zyban, Wellbutrin) to add new Boxed Warnings and develop patient Medication Guides highlighting the risk of serious neuropsychiatric symptoms in patients using this product. These symptoms include changes in behavior, hostility, agitation, depressed mood, suicidal thoughts and behavior, and attempted suicide. Source: “Zyban (bupropion hydrochloride) Sustained-Release tablets,” FDA MedWatch, July 2009. Source: “Japan Revises SSRI Warnings–Hostility, Violence,” Medical News Today, May 28, 2009. United Kingdom, March 2009: Medicines and Healthcare products Regulatory Agency (UK) published in their Drug Safety Update newsletter new information about Atomoxetine (Strattera). They warned that Atomoxetine is associated with treatment-emergent psychotic or manic symptoms in Children without a history of such disorders. Continued case reports of possible nervous-system and psychiatric adverse effects prompted a review of data from all sources, resulting in updated information on the risk of new-onset or worsening of serious psychiatric disorders, including psychotic reactions, hallucinations, mania, and agitation. Source: “Atomoxetine: risk of psychotic or manic symptoms,” Drug Safety Update, MHRA, Vol. 2, Iss. 8, March 2009. Source: “Boxed Warning, Contraindications and strengthened Precautions for Methylphenidate,” Janssen-Cilag, February 2009. Australia, December 2008: The Australian Adverse Drug Reactions Bulletin published an article about the psychostimulant Modafinil (Modavigil). The bulletin advised that this drug has caused serious adverse skin and psychiatric reactions. Psychiatric reactions have been reported in patients using Modafinil both with and without a psychiatric history. Five Australian cases had reported symptoms of: anxiety, abnormal behaviour, guilt feelings, rapid relapse/onset of depression, suicidal ideation, suicidal behaviour, psychotic disorder and delusion. All had recovered when the drug was ceased. Overseas reports of psychiatric reactions have also described hallucinations, aggression and mania. Source: “Modafinil: adverse skin and psychiatric reactions,” Australian Adverse Drug Reactions Bulletin, Vol. 27, No. 6, December 2008. Source: Atomoxetine, Summary of Product Characteristics, eMC, November 11, 2008, http://medicines.org.uk/emc/history/14482. United States, October 24, 2007: FDA and Cephalon (pharmaceutical company) notified health care professionals about updates to the Warnings section in the drug label for the company’s stimulant Provigil. The label now includes warnings regarding serious rash, including Stevens-Johnson Syndrome (A life-threatening skin reaction, often caused by an allergic reaction to a drug) and hypersensitivity reactions, and psychiatric symptoms. Psychiatric adverse experiences (including anxiety, mania, hallucinations, and suicidal ideation) have been reported in patients treated with Provigil. Further healthcare professionals should be aware that Provigil is not approved for use in pediatric patients for any indication. Source: “Provigil (modafinil) tablets,” FDA MedWatch, October 24, 2007. United States, May 2007: The FDA updated Geodon’s drug safety label adding the following adverse reactions that had been observed during postmarket use of the drug: details on allergic reactions (such as allergic dermatitis [inflammation of the skin], angioedema [rapid swelling of the deep layers of skin], orofacial edema [swelling in the mouth and/or face], urticaria [hives]), mania/hypomania, Serotonin Syndrome (a potentially serious and potentially life-threatening drug reaction that occurs when too much serotonin builds up in the body), syncope (temporary loss of consciousness), and priapism (a prolonged and often painful erection). Source: “Detailed View: Safety Labeling Changes Approved By FDA Center for Drug Evaluation and Research (CDER) — May 2007” FDA MedWatch, May 2007. Source: “Detailed View: Safety Labeling Changes Approved By FDA Center for Drug Evaluation and Research (CDER) — May 2007,” FDA MedWatch, May 2007. United States, February 21, 2007: The FDA directed ADHD drug manufacturers to distribute “patient friendly” guides to consumers warning about cardiovascular risks associated with these drugs, including: stroke, heart attack, sudden death. As well as psychiatric adverse events such as: hearing voices, becoming suspicious for no reason, or becoming manic, even in patients who did not have previous psychiatric problems. United States, August 21, 2006: The FDA said ADHD drug’s prescribing information had been updated to include information about reports of sudden death in children and adolescents with pre-existing heart problems. In addition there have been reports of drug-related psychotic or manic symptoms such as hallucinations, delusional thinking, or mania even in children and adolescents who did not have previous psychiatric problems. It also has new data about the drugs’ suppression of growth, seizures (in those with prior history of seizures) and visual disturbances. Source: “Detailed View: Safety Labeling Changes Approved by FDA Center for Drug Evaluation and Research (CDER) — August 2006,” FDA MedWatch, August 2006; “2006 Safety Alerts for Drugs, Biologics, Medical Devices, and Dietary Supplements, Dexedrine (dextroamphetamine sulfate)”, MedWatch, August 21, 2006. United States, November 2005: The FDA’s Safety Information and Adverse Event Reporting Program reported safety label changes for Effexor XR (extended release).This included Warnings of sustained hypertension (high blood pressure), and the following Adverse Reactions: adverse events association with discontinuation of treatment, panic disorder, and homicidal ideation. Source: “Detailed View: Safety Labeling Changes Approved By FDA Center for Drug Evaluation and Research (CDER) — November 2005,” FDA MedWatch, November 2005. European Union, August 19, 2005: The Commission of the European Communities, representing 25 European countries, endorsed and issued the strongest warning yet against child antidepressant use as recommended by Europe’s Committee for Medicinal Products for Human Use (CHMP). Clinical trials had shown that the drugs caused suicidal behavior including suicide attempts and suicidal ideation, hostility (predominantly aggression, oppositional behavior and anger) and/or related behavior. Source: ANNEX II – Scientific Conclusions and Grounds for Amendment of the Summaries of Product Characteristics and Package Leaflets Presented by the EMEA. In Commission Decision of 19-VIII-2005 concerning the placing on the market, under Article 31 of the Directive 2001/83/EC of the European Parliament and of the Council…Brussels: Commission of the European Communities. C(2005) 3256. Australia, December 2004: The Australian Adverse Drug Reactions Advisory Committee had reviewed data on the safety and efficacy of using SSRI antidepressants in children for the treatment of depression. Their assessment of published and unpublished data available for SSRI use in children and adolescents indicated that there is evidence of an increased risk of suicidality, including suicidal ideation, suicide attempts and self-harm events, associated with each of the SSRIs. Further, in a recent study involving fluoxetine (Prozac), there was an increase in some adverse psychiatric events (acts and ideation of suicide, self-harm, aggression and violence). Source: Duncan Topliss, et al., “Use of SSRI antidepressants in children and adolescents,” Australian Adverse Drug Reactions Bulletin, Therapeutic Goods Administration, Vol. 23, No. 6, December 2004. Source: “Antidepressant aggression concern,” BBC News, September 21, 2004. Source: Jirina Vlk, “Health Canada advises Canadians of stronger warnings for SSRIs and other newer anti-depressants,” Health Canada, June 3, 2004. European Union, April 22, 2004: The European Agency for the Evaluation of Medicinal Products issued a press release which reported that paroxetine (Paxil) should not be used in children and adolescents as clinical trials have found paroxetine to be associated with increased risk of suicidal behavior and hostility, and did not prove to be effective. In addition, there is a possibility of an increased risk of suicide-related behavior in young adults. The committee also recommended strengthened warnings on the withdrawal symptoms of paroxetine, which are common. Source: “European Agency for the Evaluation of Medicinal Products: Committee for Proprietary Medicinal Products 20-22 April 2004” EMEA, The European Agency for the Evaluation of Medicinal Products, Press Release April 22, 2004. Source: “Worsening Depression and Suicidality in Patients Being Treated with Antidepressant Medications,” FDA Public Health Advisory, March 22, 2004. Canada, August 22, 2003: Health Canada posted a letter sent out to health care professionals about updates to Effexor’s prescribing information. The letter explained that in clinical studies in pediatric patients (aged 6 to 17), efficacy was not established for major depressive disorder or generalized anxiety disorder. Also, there were increased reports among those patients on Effexor XR (vs. placebo) of hostility and suicide-related adverse events, such as suicidal ideation and self-harm. Source: “Important Safety Information Regarding the use of Effexor (venlafaxine HCI) Tablets and Effexor XR (venlafaxine HCI Capsules in Children and Adolescents – Wyeth Pharmaceuticals,” Health Canada, September 24, 2003. United States, October 1995: The U.S. Drug Enforcement Administration (DEA) said methylphenidate (Ritalin) use could lead to addiction. Also, that psychotic episodes, violent behavior, bizarre mannerisms, paranoid delusions, and hallucinations have all been associated with its abuse. Source: “Methylphenidate, (A Background Paper),” Drug and Chemical Evaluation Section, Office of Diversion Control, U.S. Drug Enforcement Administration (DEA), October 1995.